Following the coastline of Formentera you will find five defence towers that were built in the XVIII century to protect the island against pirates. They are part of a network of towers used to establish visual communication between the most strategic points of the island. To communicate between tower and tower, during the day they used smoke and at night they used fire. The tower of Guardiola, restored some years ago by the Insular Council, is the oldest. 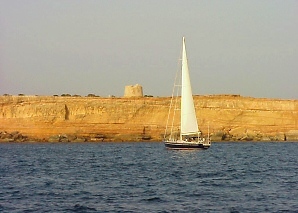 It is situated on the small island of Espalmador and was built between 1749 and 1750. Later the towers of sa Punta Prima, la Gavina, Cap de Barbaria and Pi des Català were built, that were prepared to incorporate artillery to serve not only as watch towers but also as active defence towers, although finally artillery proceeding from the Sant Francesc Xavier church was only installed in the tower Es Cap de Barbaria and Es Pi des Català. This defence system guaranteed the safety of the population during the XVII and XVIII centuries favouring the demographic growth of the population of Eivissa, and contributing to the consolidation of the process of repopulation of Formentera started at the end of the XVII century.